While graphic design is seen as a utilitarian advertising tool, it can also be used as a form of activism. More recently, designers are straying from the old notion that graphic design should be devoid of emotion. Designers are breaking archaic rules that don’t serve their messages and they are bringing humanity to the artform. Kristina Ketola Bore wrote for A New Type of Imprint about how activism is breaking into the graphic design world as the call for diversity grows louder. The Office of Culture & Design (OCD) in Manilla creates work that tackles decolonization and centers colonized voices. They believe that in order to affect social change, artists must collaborate with the people in their intended audience. It does no good to be inspired by people if an artist doesn’t work with them to make sure their stories are being told in their own contexts. Oftentimes, when designers don’t make their work a collaboration with marginalized groups, they end up projecting Western views that don’t apply. According to OCD, it’s critical that artists include other people and their experiences in their work in order to create a more welcome space for folks who have been cast out. It’s important that when we use graphic design as a tool, that we include the communities we are trying to help in the artistic process. Another designer who is using his talents to bring awareness to social issues is Timothy Goodman. 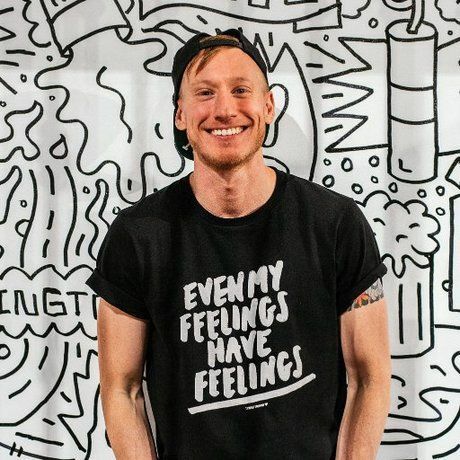 He has a large audience on Instagram that finds his openness about his struggles with his mental health and romantic relationships to be relatable and validating. Goodman says that he used to be a working designer creating art for brands but then he realized he wasn’t being fulfilled. He wanted to use his art to heal himself and make connections with folks who could use some healing, as well. Through his collaborative projects, 40 Days of Dating and Friends with Secrets, Goodman tackles depression, anxiety, and heartbreak in an accessible way because he believes that “it’s an artist’s job to shine the truth back on people.” These are things that so many people go through and if Goodman has the platform to connect to others and provide a space for people to connect with each other, he believes he is doing his job. He is a part of a growing set of designers who are mixing their personal life with their professional life and since doing so, Goodman has been much more fulfilled and he is proud to be making a difference in people’s lives. Graphic design can be fun and is an integral part of successful advertising. But it is also an art form that can express much more meaning than which product one should buy. Like all forms of art, graphic design can be used as a social commentary and a means to inclusivity and diversity.